Nathaniel Mellors, The Nest, 2011. Installation view at Cobra Museum, Amstelveen. 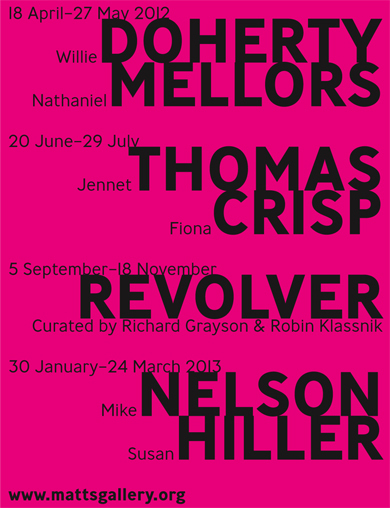 Mellors’ third exhibition at Matt’s Gallery will run 18 April–27 May 2012. Alison Turnbull, Orto Botanico, 2002/2011. Archival inkjet print, gouache and pencil on paper, black and white photograph. Photograph Talbot Rice Gallery & Chris Park, 2012. On exhibition at Talbot Rice Gallery until 5 May 2012. 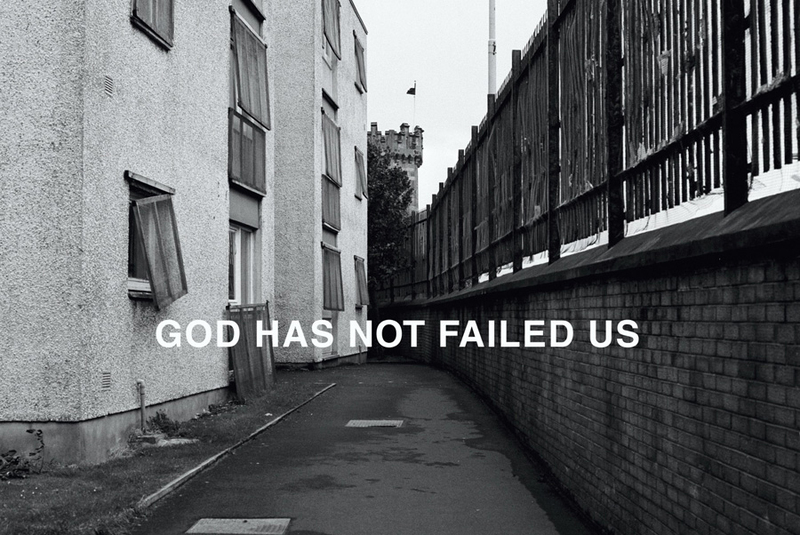 Willie Doherty, God Has Not Failed Us, 1990. Black and white photograph with text, 122 x 183 cm. 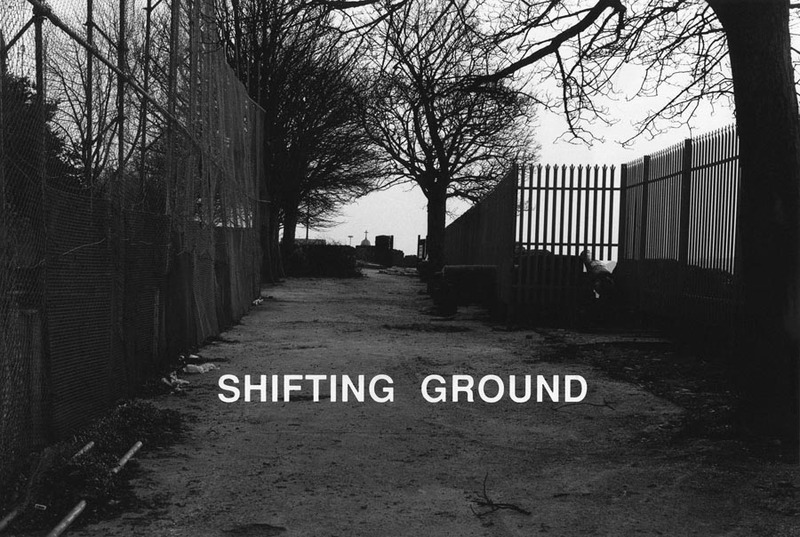 Willie Doherty, Shifting Ground, 1991. Black and white photograph with text mounted on aluminium, 122 x 183 cm. Matt’s Gallery hosts an exhibition of Willie Doherty’s black and white photographs from 1985-1992, which have rarely been exhibited before. 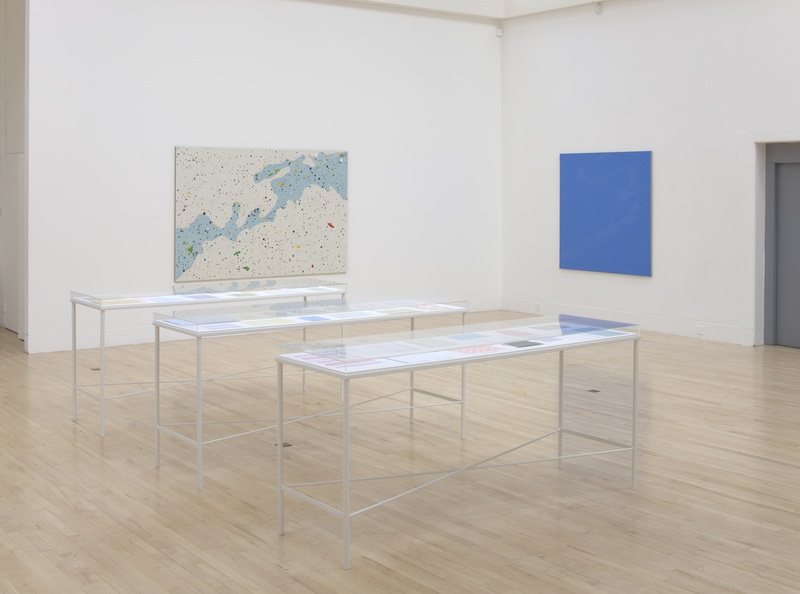 These early works developed conceptual and formal strategies that resided in Doherty’s practice over the next two decades to the present. In particular, they foreshadow his distinctive use of voiceover and disjointed narrative in the body of the video works he has subsequently produced. Ourhouse E3 feat. BAD COPY is Nathaniel Mellors’ third exhibition at Matt’s Gallery. 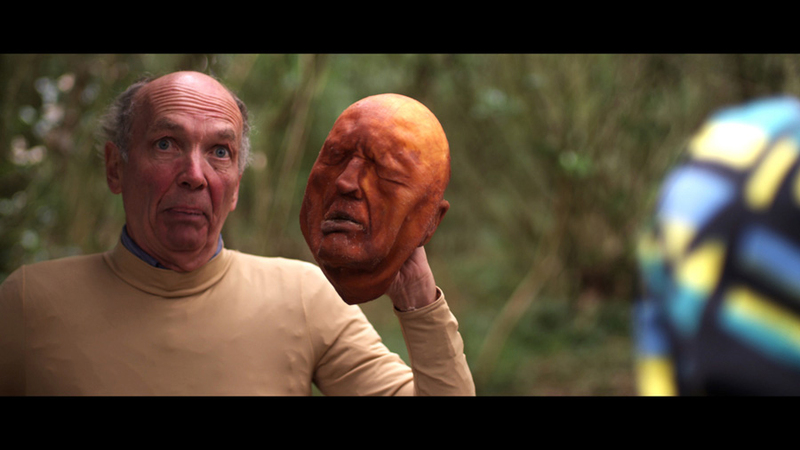 It includes the latest episode of Mellors’ absurdist video series Ourhouse Episode 3: The Cure of Folly and a new animatronic installation, BAD COPY, developed from a double character played by Roger Sloman in The Cure of Folly. The 2012-13 programme is the first in which both spaces at Matt’s Gallery will be used to present exhibitions running concurrently. Matt’s Gallery has two large galleries on site; in the past one housed a public exhibition, whilst the other provided a private, working artist’s studio for the next exhibiting artist to develop new work. Over the last 32 years we have averaged four exhibitions per year; in 2012-13 we will present 13. In this period, whilst continuing to support new work by artists made specifically for Matt’s Gallery, the programme will represent work made elsewhere and at other times, so diversifying connections and contrasts both for the artists and for the audience. Willie Doherty, Jimmie Durham and Susan Hiller will be taking part in the major international survey exhibition dOCUMENTA(13), which takes place in Kassel, Germany. 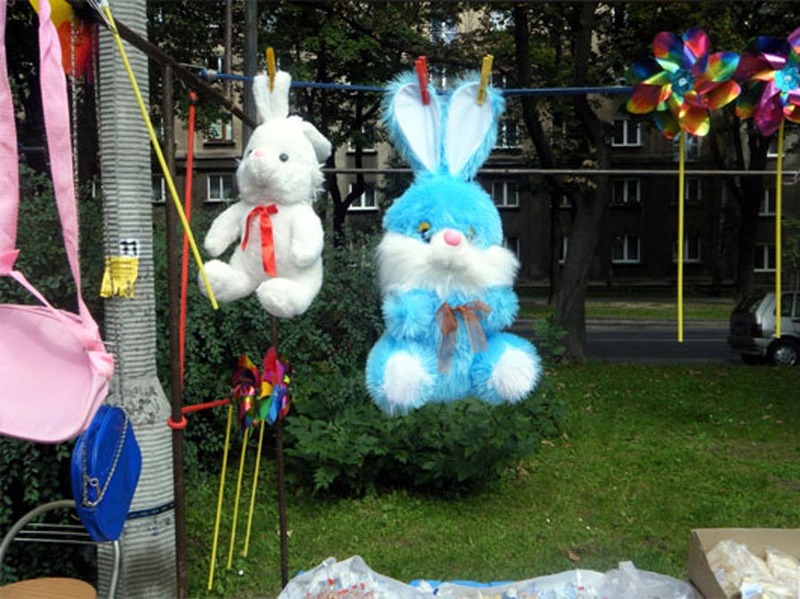 This year the exhibition is curated by Carolyn Christov-Barkargiev. Alison Turnbull, exhibition view at Talbot Rice Gallery. Photograph by Ruth Clark. This major solo exhibition presents a survey of Alison Turnbull’s recent work, alongside newly commissioned pieces and a wall painting made in situ at the gallery. 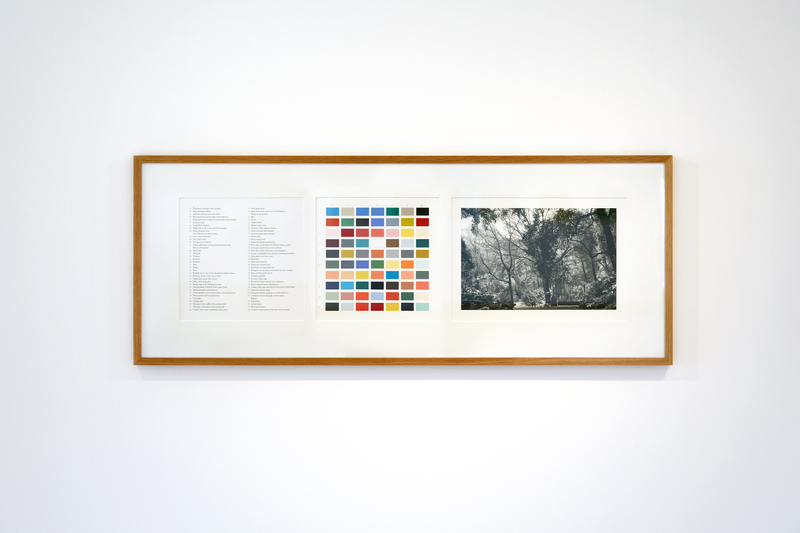 The exhibition is accompanied by a new publication featuring an essay by Ed Krcma and an interview with the artist. Emma Hart, Everything Sucked Out, From the Inside, 2012. Video still. Emma Hart has been picked from a 50-strong nominated shortlist of early to mid-career artists specialising in the moving image, as one of the first recipients of The Jerwood/Film and Video Umbrella Awards. Emma Hart, Ed Atkins, Naheed Raza and Corin Sworn have been given the opportunity to develop proposals for a ‘project for the future’. These pilot pieces are being presented as part of the Jerwood Visual Arts programme at Jerwood Space. 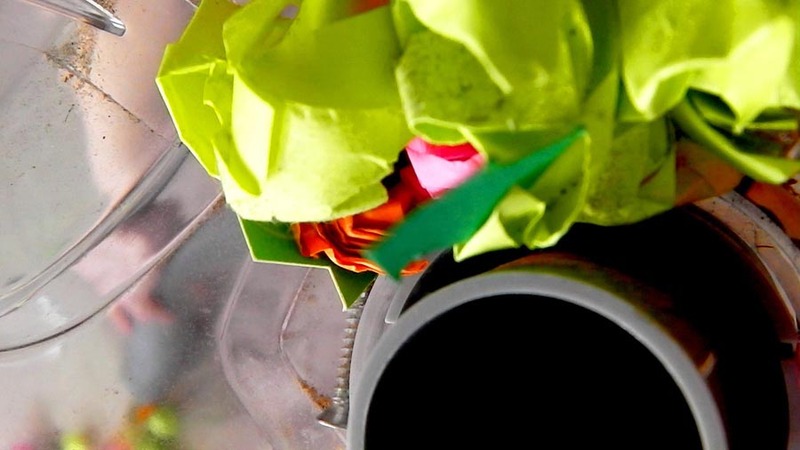 Modern Art Oxford presents an offsite screening of Green Lady, which was made during Baseman’s residency at St John’s College, Oxford, 2011 and first shown by Matt’s Gallery at Genesis Cinema. The screening is accompanied by the publication 1973. 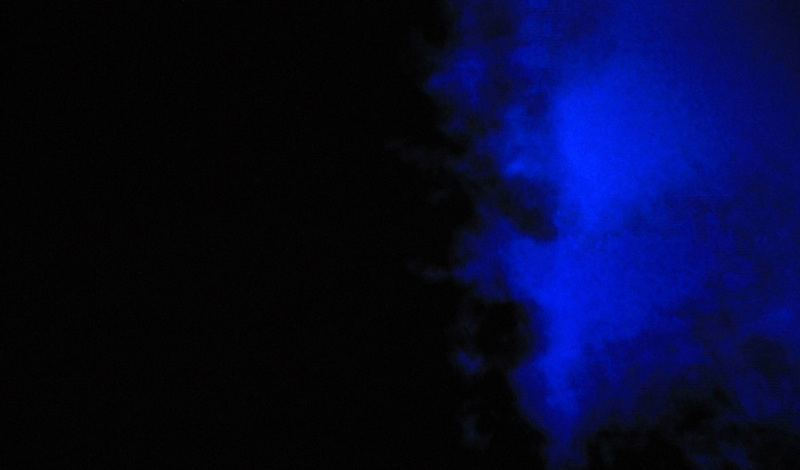 Jordan Baseman has been awarded Best Experimental Film at the IFS Festival in California. The Last Walk features the British performance artist Stuart Brisley. What starts off as an ordinary walk in the park for Stuart and his dog, soon becomes an account of witnessing a public suicide. 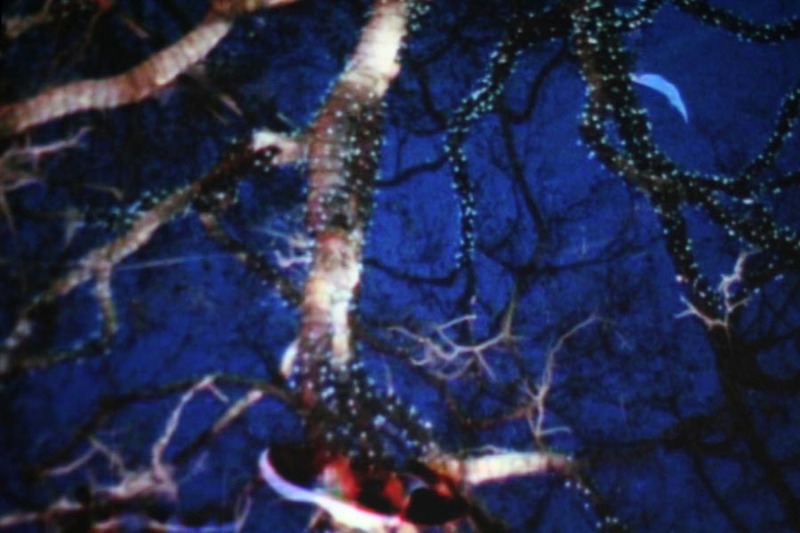 The film is visually driven by hand-processed 16mm film that depicts a fragment of reflected light in Christmas-lit, winter trees. Lindsay Seers,Monocular, 2011. 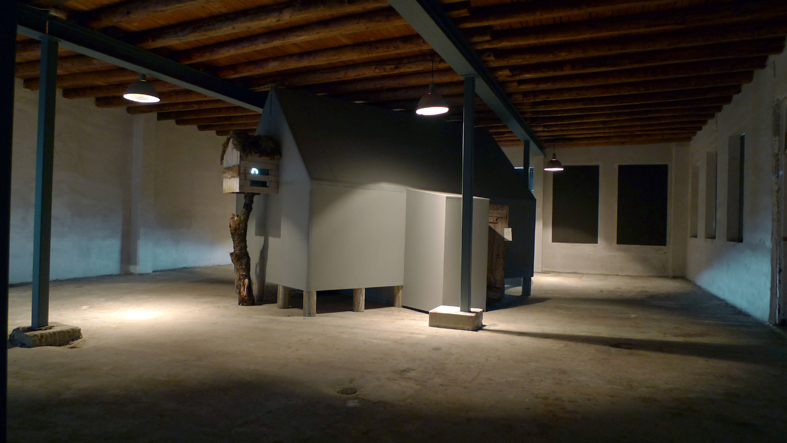 Installation view at Lofoten International Art Festival. Lindsay Seers’ video installation work Monocular3 will be part of a group show at Kunstverein Freiburg. The title of this exhibition refers to the famous saying by Arthur Rimbaud: Je est un autre. The grammatical distortion already expresses the awkwardness of wanting to objectify the self. The self in contemporary art is often difficult to differentiate from the public person and from the brand for whom and for which the work represents. Nonetheless, it is in precisely here in this space of ambiguity, where autobiography blends in with fiction, that has become fruitful terrain-a house of mirrors, where no one is what they appear to be. 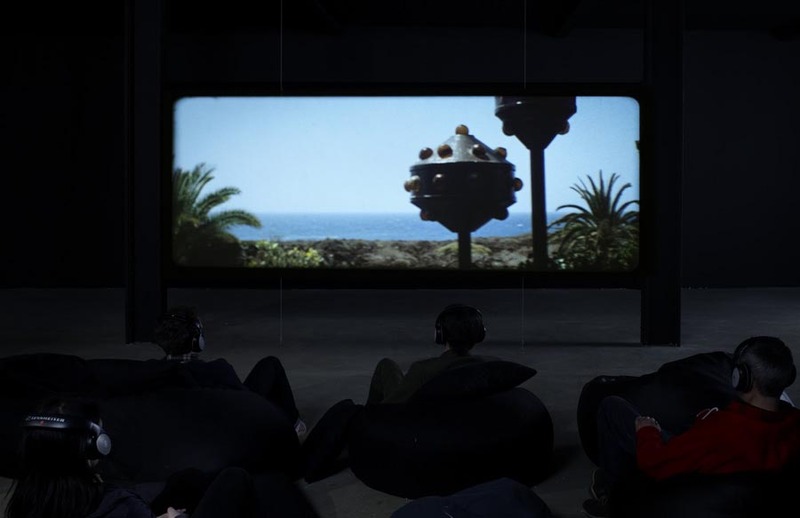 A Trip to the Moon is an exhibition focusing on the relationship between art and film. Is it part of a collaborative project between Bonniers Konsthall and Moderna Museet. 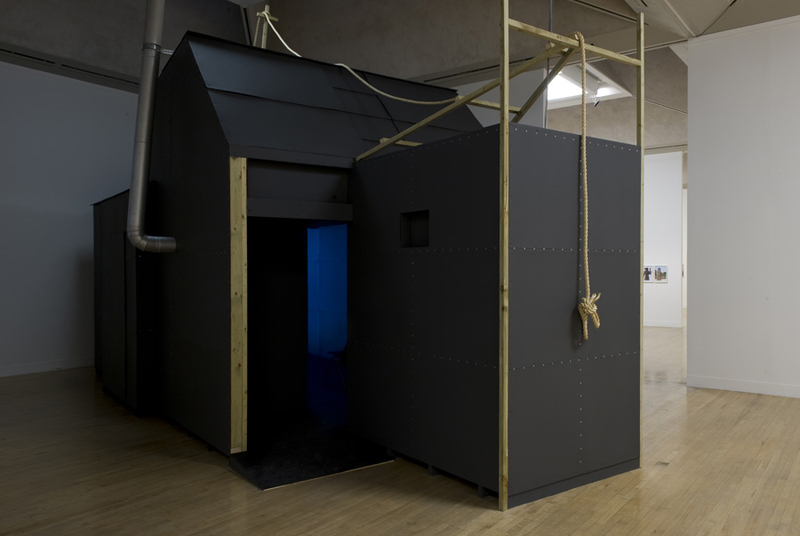 The exhibition includes Lindsay Seers’ work Extramission 6 (Black Maria), 2009 which was first shown as part of Altermodern at Tate Britain in 2009. 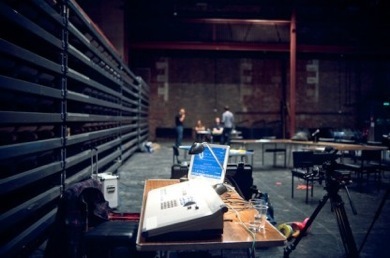 The Making Of Development Week, Glasgow International Festival of Visual Art, 2011. Photography by Tommy Ga-Ken Wan. Graham Fagen is collaborating with theatre director Graham Eatough, director of photography Michael McDonough and film producer Angela Murray to create The making of us at Glasgow International Festival. Combining elements of installation and promenade theatre, the project centres on a unique approach to the role of film in a live event. Graham Fagen, Missing, 2011. Installation view. 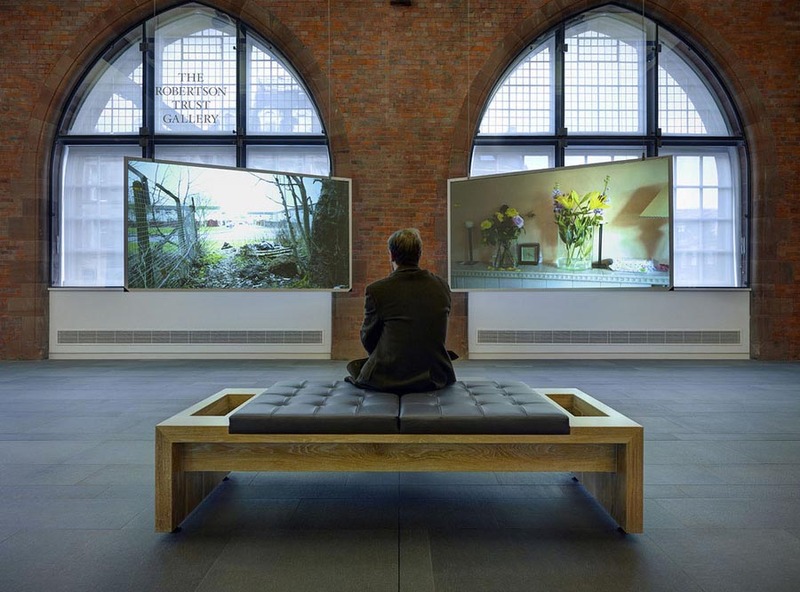 Graham Fagen’s specially commissioned two screen video installation Missing inaugurates the contemporary programme at the re-opening of the Scottish National Portrait Gallery, following two years of closure for refurbishment. Mike Nelson will be showing new work at Neugerriemscheider from 27 April 2012. The opening of this exhibition coincides with Berlin Gallery Weekend and the start of the Berlin Biennale. 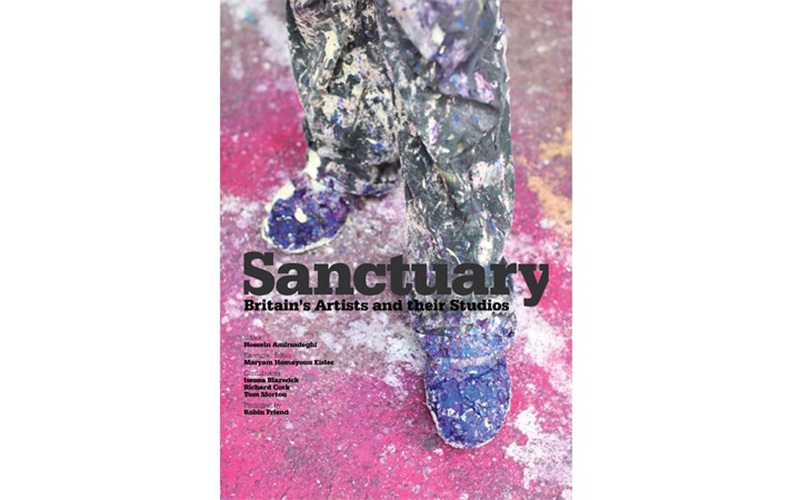 Sanctuary: Britain’s Artists and their Studios is a collection of interviews with artists which explores current studio practices. Published by TransGlobe Publishing and Thames and Hudson, the book is edited by Hossein Amirsadeghi and Miriam Homayoun Eisler, with contributions from Iwona Blazwick, Richard Cork and Tom Morton. It includes interviews with numerous artists including Mike Nelson, Susan Hiller and Jananne Al-Ani. Ben Rivers, Slow Action, 2010. Installation view at Matt’s Gallery. 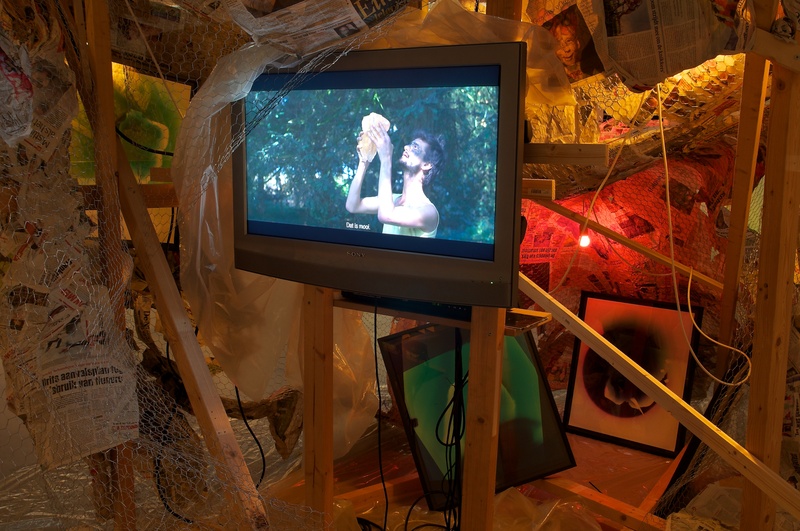 This exhibition includes Ben Rivers’ work Slow Action, 2010, which was shown at Matt’s Gallery in 2011 and commissioned by Picture This and Animate Projects in association with Matt’s Gallery, London. This group exhibition asks how art can address injustice and infringements on human dignity without being didactic. 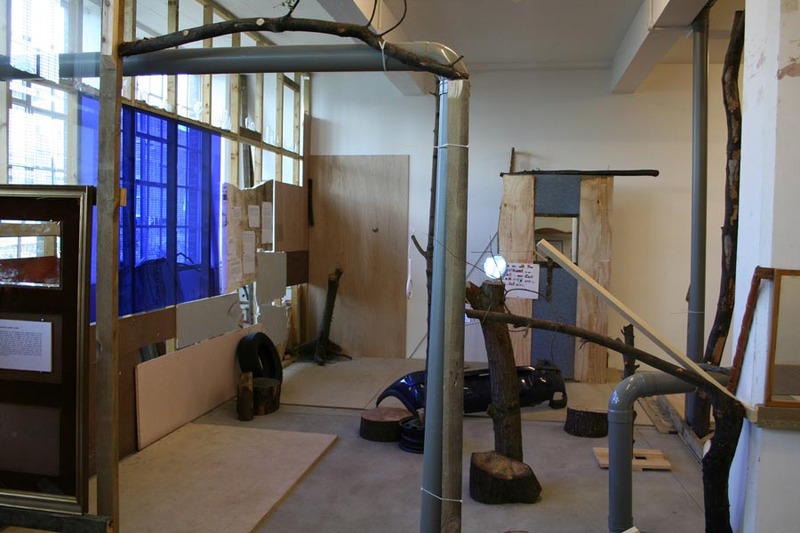 It includes Jimmie Durham’s major installation work Building a Nation, which was commissioned by Matt’s Gallery in 2006 which has recently been acquired for the Museum Ludwig collection. Paul Carter’s sculptural practice investigates the expanded possibilities and limited enclosures afforded by architectural structures and objects. At SHIFT. Carter manifests something akin to a latent state of drawing hinting towards a fluid state of process, an accumulation of materials suggesting potentialities of form and constructions. Paul Rooney, Blank Stir, 2012. Photograph by Leo Fitzmaurice. Paul Rooney will be exhibiting at Grundy Art Gallery, Blackpool in a show entitled Blank Stir with Leo Fitzmaurice. This will feature Rooney’s new sound work, Black Ear. The exhibition will comprise of two separate installations whose relationship to one another is in their purpose to unsettle the gallery environment and disorientate the visitor.